In 1905 Heubach set up the Tuxedo Park Land Co. He found a collection of Minneapolis based investors who had built great wealth in the grain industry. Over the next year the Tuxedo Park Company bought 3,000 acres from Mary and Archibald Wright and other owners for $450,000. The first home in the area an old farmhouse still stands at the south-east corner of Academy and Wellington Cresc. Heubach died the following year and was succeeded by FL Finkelstein as mayor. from 1911 Finkelstein with an accounting background became a partner with Heubach and Heubach’s son Claude. Finkelstein would serve as mayor and would go on to run the company successfully into the 1950s. The plan for the town had been designed by the famous Frederick Law Olmstead firm, and it became the city plan in 1911. It had combined residential areas, areas of work in the south including the Canada Cement Plant. The first house was built in 1915 by Raymond Carey on the north corner of Nanton and Park. The area was connected by a mud road that became Nanton Blvd. Carey was fairly isolated and had to get the plows out before he could traverse the mud road through the as yet undeveloped aspen wooded area east of his home. Carey married Heubach’s daughter Claire, Carey, a british architect, had come to Winnipeg in 1909 from Detroit and was well known for his Georgian style homes. In 1923, Frederick Heubach’s son Claude, built a home at the south corner. Designed and built buy Northwood and Carey. Later Claude Heubach moved to Hosmer to one of the first homes south of Corydon Ave. In the 1920s a series of homes sprung up along the east side of Park Boulevard facing Assiniboine Park. Many homes were owned by grain industry businessmen. In 1925 the first house was built on Lamont. The site originally reserved for the University became Tuxedo Golf Course. The four room Tuxedo Schoolhouse was built in 1926. Many area street names have changed since the original plan. Tuxedo Blvd was originally called Van Horne. The plan reserved a strip of land just south of the Agricultural College. It eventually became the Youth centre, commercial and public housing and military land. 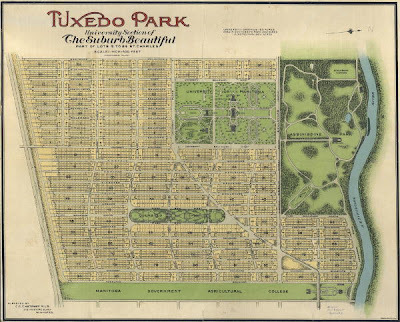 By 1911 the new plan for Tuxedo was complete. It was anticipated that in time the University of Manitoba would be located at Tuxedo but after 1926 when it located in Fort Garry. There are many famous builders like Frank Lount and the Sparrow Brothers that built the area’s homes.